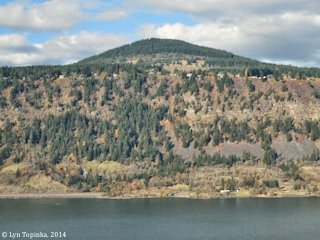 "Underwood and Underwood Mountain, Washington"
Click image to enlarge Underwood Mountain, Washington, as seen from Hood River, Oregon. The Spring Creek Fish Hatchery at Hood, Washington, is at the base of Underwood Mountain. Image taken September 26, 2003. 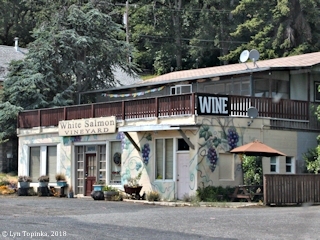 The town of Underwood is located on the Washington side of the Columbia River at River Mile (RM) 168, on the right bank of the White Salmon River. Immediately downstream is the Spring Creek National Fish Hatchery and the small community of Hood. Seven miles downstream is the small community of Cook. The Cook-Underwood Road connects the two communities. Across the river on the Oregon side is Hood River. Underwood Mountain rises between the Little White Salmon River downstream, and the White Salmon River upstream. 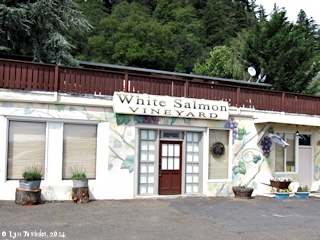 The towns of Underwood and Hood lie at its base, along with the Spring Creek Fish Hatchery. 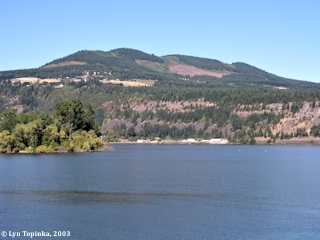 A good view of Hood, Underwood, and Underwood Mountain can be had from the Oregon side of the Columbia at Hood River, or just west of Hood River at Ruthton Park. "Underwood Mountain, Washington (2,755 feet elevation), is an early Pleistocene shield volcano that erupted between 20,000 and 850,000 years ago, and covered east-dipping Grande Ronde Basalt a few hundred feet above the river. The basalt of Underwood Mountain is composed of numerous blocky, jointed flows, each about 10 to 30 feet thick. The total thickness of the basalt reaches at least 590 feet. 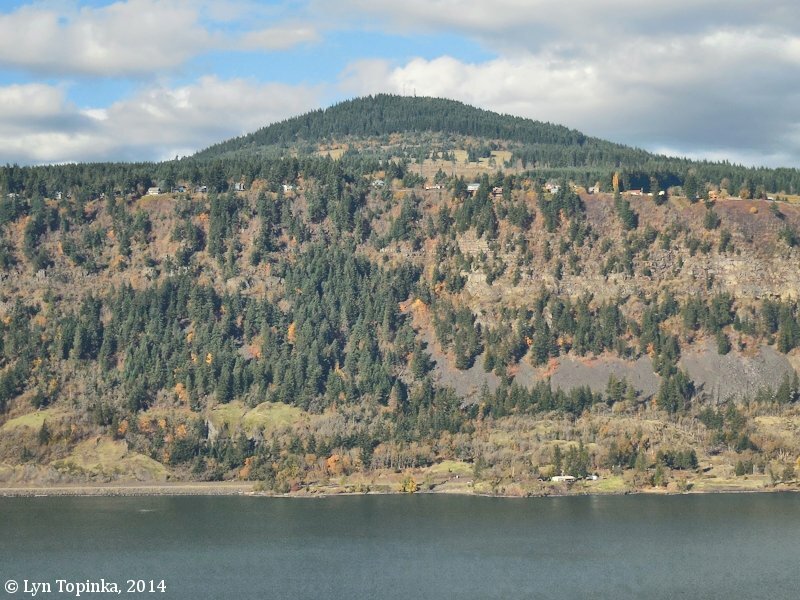 Underwood lavas crossed and probably briefly dammed the Columbia River, as remnants of the Underwood flows can be found on the Oregon side." Source: Lloyd DeKay and Terry Hurd, 2011, Columbia River Gorge Chapter Ice Age Floods Institute 2011 Field Trip. 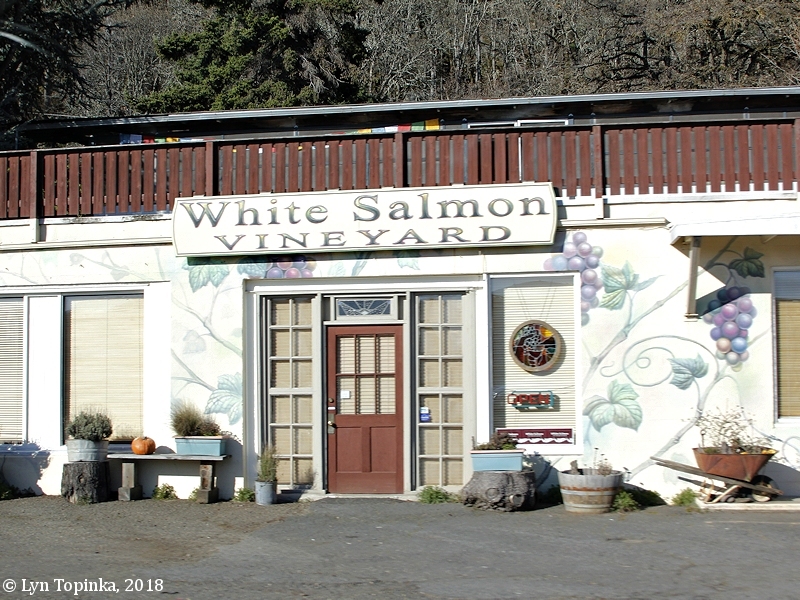 "Underwood, a town on the north bank of the Columbia River, in the southeastern part of Skamania County, was named for Amos Underwood, who crossed the plains in 1852 and spent the rest of his life along the Columbia. He settled at the place which bears his name in 1875. He was still liveing in 1915, at the age of 81 years. (H.S. Adams, in Names MSS. Letter 235.)" 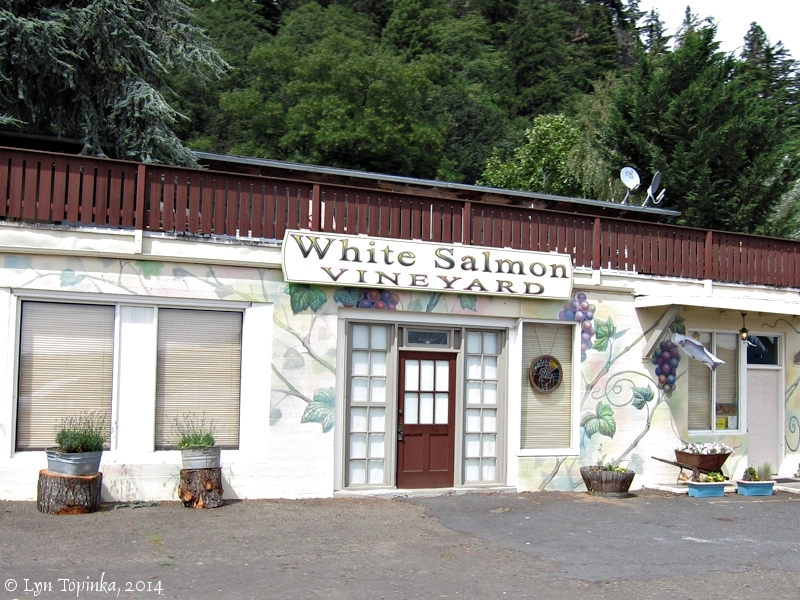 "Underwood (S.23;T.3N;R.10E): Townsite on west bank of White Salmon River at its confluence with Columbia River, extreme southeast Skamania County. It is named for Andoniram Judson Underwood, a veteran of the Yakima Indian wars, who settled here in 1875 and who platted the townsite in the fall of 1881." Note: in error ... According to Warren Upham in "Minnesota Place Names" (2001), Andoniram Judson Underwood was the founder of Underwood, Minnesota, which he platted in 1881. "Sally" Victoria Mistretta (personal communication, 2008) writes the town of Underwood was founded by her Great-Great-Grandfather Amos Underwood. The 1870 Federal Census for Skamania County, Washington Territory, lists Amos Underwood, age 34, farm labourer, born in Indiana, race "W", and Ellen Underwood, age 30, keeping house, born in Washington Territory, race "I", and four children, Isabella, age 14, Jefferson, age 7, Mary, age 5, and Marshal, age 1 (Rootsweb.com website, 2008). The 1875 cadastral survey map (tax survey) for T3N R10E, Section 22, shows two Underwood homes lying west of the White Salmon River. The homes are divided by the "Trail to the Cascades". North of the trail is the home of "A. Underwood" and south of the trail is the homeof "E. Underwood" (Bureau of Land Management website, 2008). The 1880 Federal Census (found on "Rootsweb.com") lists Amos Underwood, age 43, farm laborer, color "W", and his wife Ellen Underwood, age 40, color "W", and 3 children, Jefferson, age 18, Mary, age 15, and John, age 11. The 1880 census also lists Ed Underwood, age 24, farmer, color "W", and his wife Lavinia, age 23, keeping house, and 3 children, Gracie, age 7, Maggie, age 5, and Isabel, age 1 (Rootsweb.com website, 2008). The Bureau of Land Management's General Land Office Records (2007) show Amos Underwood being granted title to 160 acres of parts of T3N R10E, Sections 21 and 22, on July 7, 1885 (1862 Homestead Entry Original), and 164.5 acres for parts of T3N R10E, Section 23, on July 21, 1896 (1820 Sale-Cash Entry). The records show Edward Underwood being granted title to 160 acres for parts of T3N R10E, Section 22, on February 10, 1882 (1862 Sale-Cash Entry), and Edward Underwood being granted title to 160 acres for parts of T3N R10E Section 15, on October 26, 1892 (1862 Homestead Entry Original). In 1979 the U.S. Board of Geographic Names made "Underwood" the official name for the community. Click image to enlarge Underwood Mountain and the Broughton Mill, as seen from the Columbia Gorge Hotel, Hood River, Oregon. Image taken May 10, 2006. 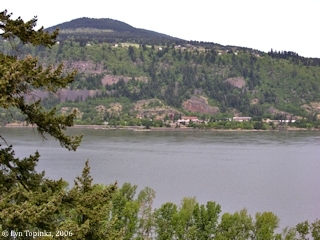 Click image to enlarge Underwood Mountain, Washington, as seen from Ruthton Park, Hood River, Oregon. Image taken November 10, 2014. Amos Underwood, a pioneer resident of Underwood, well known in Hood River, died Saturday at the home of his daughter, Mrs. Mary V. Olson at Underwood. Mr. Underwood was 83 years old and came to Oregon from Iowa in 1852. He was a veteran of early Indian wars and served as Corporal in Company B, Oregon volunteers. He was a member of the party which captured the famous Cayuse chief, Pepe Mux Mux. Later, when an Indian uprising threatened the settlement of Hood River, Mr. Underwood rendered valuable assistance to troops sent from the Dalles to protect the settlement. Source: "The Hood River Glacier", Hood River, Oregon, December 19, 1917, courtesy "rootsweb.com", 2008. Mary Underwood Lane was born on April 17, 1864 in North Bonneville, Wn., at the home of Aunt Wac-oo'-bule in Chief Wa-bana-ha's village. She died in White Salmon hospital February 14 and was buried in the family cemetery at Underwood, Wn. on Tuesday, February 2(sic). Her parents were Amos and Ellen (Chenowuth Lear) Underwood. Her father was born on December 2, 1833, in Ohio and died in 1917 at Underwood. He came to Oregon from Missouri in 1852 and was a private in the Yakima war in 1855. He first homesteaded, or purchased, the pre-emption of Peter Rudio in Hood River county (then Wasco county) in 1859. He took out his patent in February 10, 1864, and sold out to John Marden later. 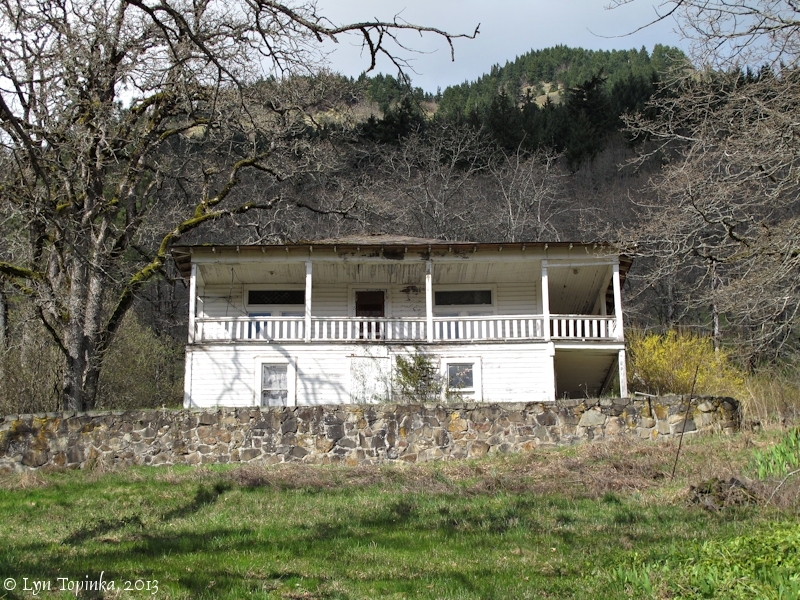 He then moved to Skamania county, Wn., where he homesteaded with a soldier's warrant west of White Salmon river (then in Klickitat county), buying railroad, timber and stone land until he owned 320 acres. He also had 10 gold mines along the river, operated at ferry between White Salmon and Hood River and owned a saloon at Underwood, Wn., which was named for him. He was familiarly known as "Captain Ame." He had a hotel and ferry at John Day with Day Leonard and owned three freighting scows also. Source: "The Hood River News", Hood River, Oregon, February 24, 1950, courtesy "rootsweb.com", 2008. 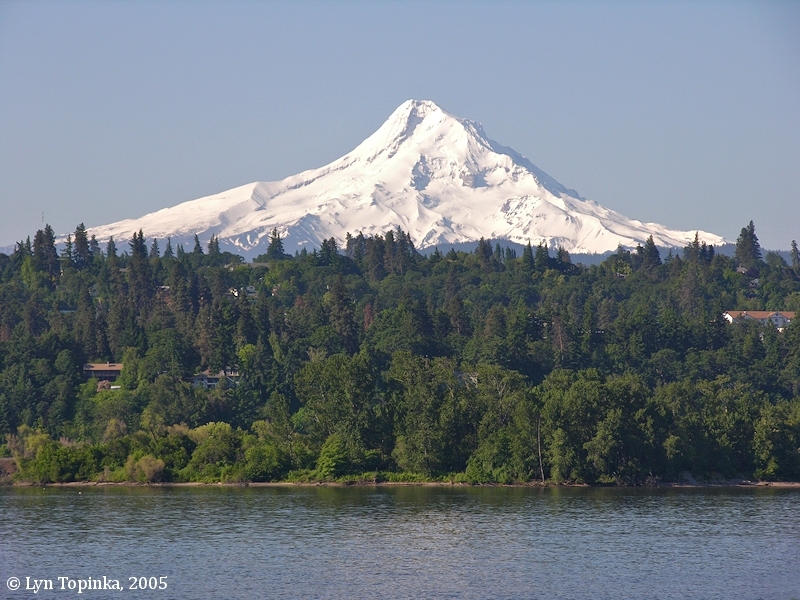 In the early 1900s a ferry took passengers from Hood River, Oregon, to Underwood, Washington. On April 11, 1806, during Lewis and Clark's return trip, the Captains handed out a "Medal of the Small size" to the Chief of the "Clah-clel-lah" tribe. This medal, one of the "Washington Season medals", ended up at the Maryhill Museum by way of the Chief's grand-daughter, Mary Underwood Lane. 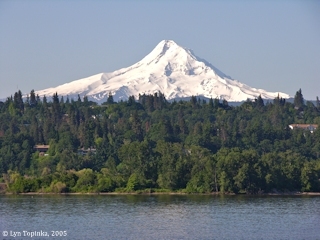 Click image to enlarge Mount Hood, Oregon, from Underwood, Washington. Underwood is just downstream of the White Salmon River, looking towards Mount Hood. 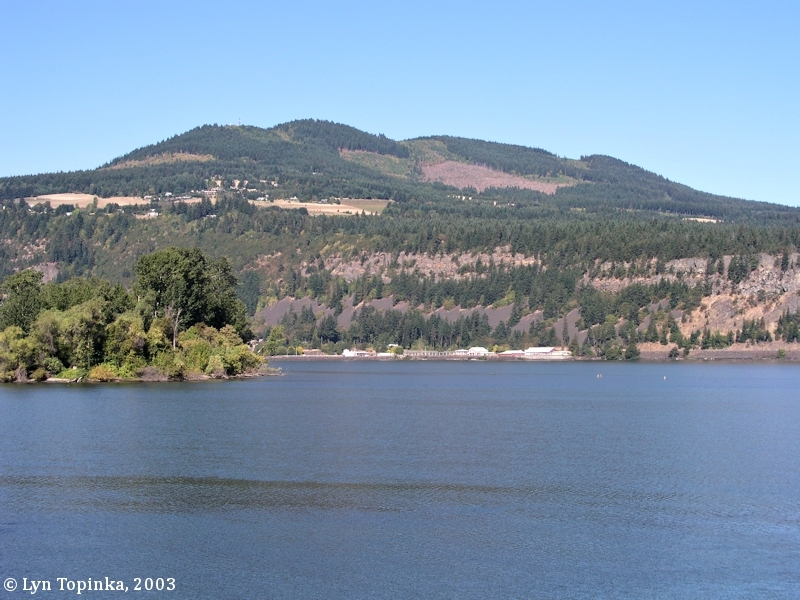 Hood River, Oregon is just upstream. View from Washington State Highway 14. Image taken May 24, 2005. The Underwood Mercantile company installed a soda fountain in their store to please the taste of their customers whose number has been increased by the installation of Ray Meggs’ service station. This service has grown from one pump to four and now demands all the time of the owners so he has had to sell the repair shop he formerly operated. Source: The Skamania County Pioneer, Stevenson, Washington, January 15, 1926, as found on "rootsweb.com" website, 2011. The Underwood Mercantile Company, one of the largest mercantile establishments in the country has been sold to Grover Brothers of Cascade Locks, Oregon, and the new owners have taken charge of the business. Source: The Enterprise, White Salmon, WA., January 7, 1927, found on "rootsweb.com" website, 2011. Although he is closing the store, he is not selling the fixtures. He is hopeful of finding a buyer to carry on the tradition that started with an Indian trading post nearly a century ago. Source: The Mt. Adams Sun, Bingen, Washington, May 14, 1964, as found on "rootsweb.com" website, 2011. Click image to enlarge Underwood Mercantile building, Underwood, Washington. View from moving car on Washington Highway 14. Image taken May 14, 2011. 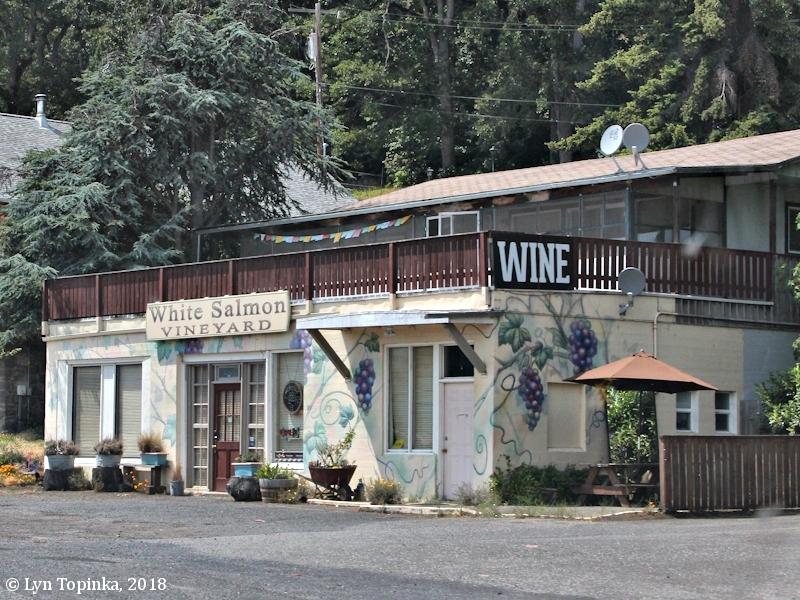 Click image to enlarge Underwood Mercantile building, now the While Salmon Vineyard building, Underwood, Washington. View from moving car on Washington Highway 14. Image taken July 21, 2014. 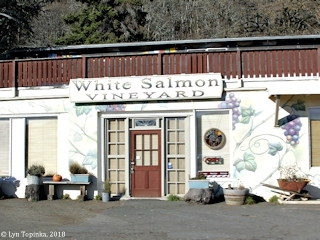 Click image to enlarge Underwood Mercantile building, now the While Salmon Vineyard building, Underwood, Washington. View from moving car on Washington Highway 14. Image taken February 12, 2018. 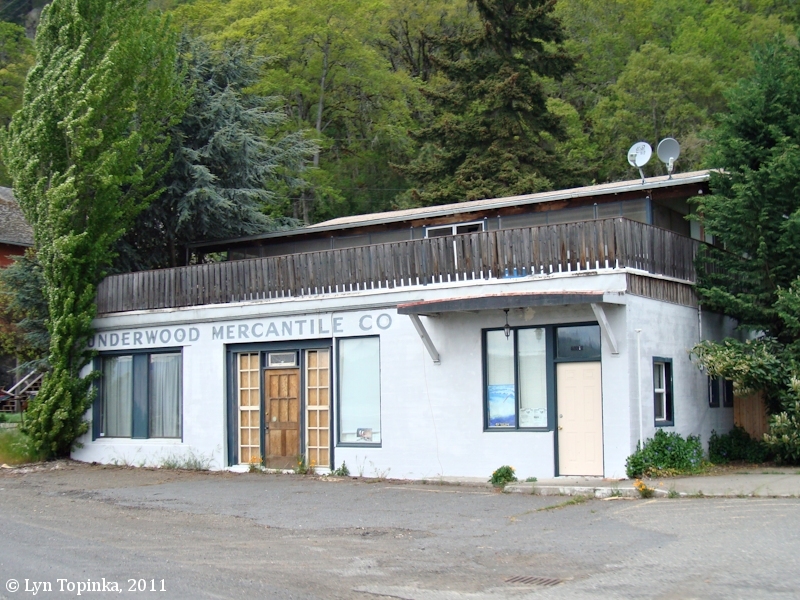 Click image to enlarge Underwood Mercantile building, now the While Salmon Vineyard building, Underwood, Washington. View from moving car on Washington Highway 14. Image taken June 6, 2018. Source: "Hood River News", Hood River, Oregon., January 5, 1923, courtesy "rootsweb.com" website, 2011. 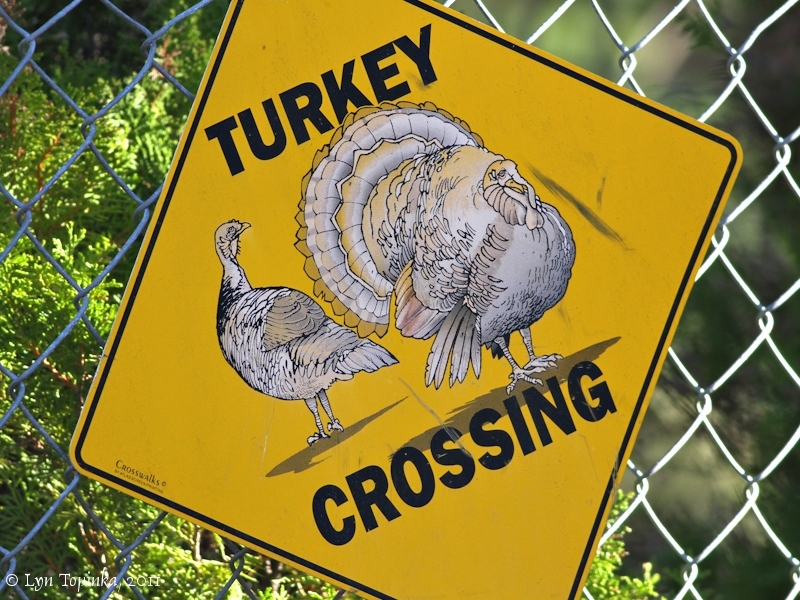 Wild Turkey wander through the backyards and streets of Underwood. Click image to enlarge Turkey Crossing sign, Underwood, Washington. Image taken February 2, 2011. 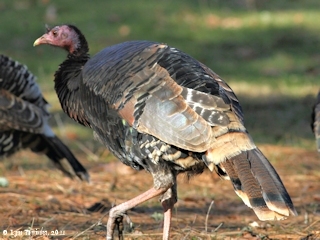 Click image to enlarge Wild Turkey, Underwood, Washington. Image taken February 2, 2011. Carrick, M., 2000, Oregon Chapter of the Lewis and Clark Trail Heritage Foundation, September 2000 Newsletter, vol.II, no.IV.